Taffy was our first cat at Applewood Lodge. We first noticed him haunting a bird feeder located right where the trellis is today. Vicki put some milk out at our front porch. And in days, she had a golden, long-haired cat in her lap. He was so full of personality, and he seemed to know these grounds inside and out. When we’d return on Friday nights, after a week of hard long hours in the city, we’d just call out — T-A-F-F-Y — and he’d come running from out of the brush or up the gravel drive. 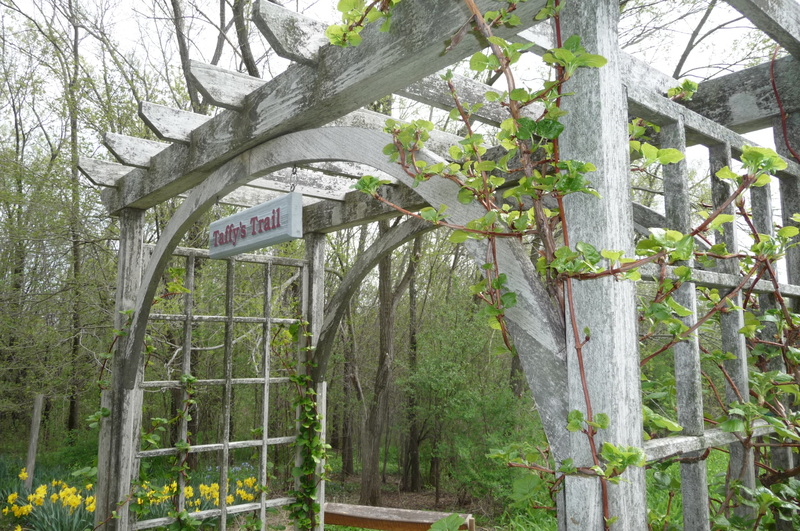 We now mow a trail through the field, beginning at the trellis, and a few years ago, we had the stone wall built to mark the transition from mowed grass to the wild flowers beyond. When we’d walk the trail, Taffy would bound through the flowers and weeds, jumping high to get a peek at where he was heading, and criss-cross the trail ahead of us, running at full tilt. He would love to ride on my shoulder as we curved along the trail, and after a hundred yards or more, a 12-pound cat with his claws digging into your shoulder began to feel like a potato sack full of pins. But he loved the ride, and the high view of his territory, and the closeness to his friends. We loved his companionship. As I look up and out to the entrance to Taffy’s Trail this morning, I can almost see his golden form on the grass. It was on this day in 1962 that 88-year-old, four-time Pulitzer Prize-winning poet Robert Frost plunged into his goodwill tour of the Soviet Union. He really wanted to be able to meet with Soviet Prime Minister Nikita Khrushchev. Frost said that he could envision “the Russian and the American democracies drawing together,” their distinctly separate ideologies eventually meeting in the middle. 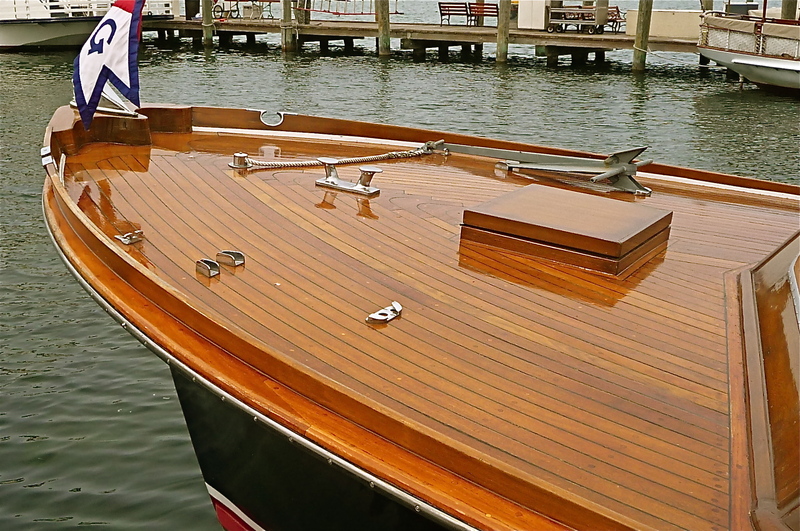 The goodwill tour was arranged, and in late August the crew set off. Frost spent his days in the USSR giving poetry readings and interviews and lectures and otherwise being a very public persona. His readings were immensely popular, with enthusiastic audiences filling venues. Frost would burst out into spontaneous recitations of his famous works wherever he went. For most of the trip, it was uncertain whether he was going to get a chance to meet with Khrushchev, which he wanted so badly. Then, toward the final days, he got word that such a meeting had been arranged, and he would get his big wish. He flew to Crimea, and he was so incredibly excited that he felt to sick too his stomach — he reported having terrible stomach cramps. He was going on 90, and there was talk of canceling the meeting, but Frost insisted that it take place. Khrushchev sent his own personal doctor ahead to attend to Frost. He was diagnosed with a case of nervous indigestion. Khrushchev ended up coming into the bedroom at the guesthouse where Frost was resting, and it was there that, at the height of the Cold War, the leader of the Communist world and the aging American poet had their famous meeting. Each man praised the other man’s work. They talked of the future of capitalism and the future of socialism. Frost told Khrushchev: “A great nation makes great poetry, and great poetry makes a nation.” And then Frost daringly took a stab at discussing one of the Cold War’s central issues: He urged Khrushchev to reunite East and West Berlin. Khrushchev declined, and explained to Frost why it was important for the Soviet Union to keep it how it was. The two men talked for an hour and a half. A Sunday morning TV program today highlighted the continuing lack of spending and preparation for national disasters, on this 5th anniversary of Katrina. One study shows that disaster preparation costs 1/15th as much as disaster response, and that politicians who opt for spending on disaster readiness get no incremental votes, while those who spend on disaster response get a bump in voter support. Yes, preparedness is boring, hard work, while disaster response is adrenaline-boosting, visceral, and I suppose, instantly gratifying. If we realized how little preparedness there is in place for nuclear disaster, civilian accident or attack, we would be paranoid. Natural disaster planning, training and resource pre-placement is tokenism and minimal is most cases. I was a contingency planner in the Army years ago, and can attest to how marginally prepared we were then. Most of the planning was on paper, emergency supplies were out of date or missing, training was almost non-existent, staffing was embarrassingly minimal. As a young lieutenant, when I called these short-falls to the attention of superiors, they seemed shamed by having the subject raised, and only then allocated some new training and resources, and probably only for a short time. Then there was the oil leak in the Gulf, demonstrating how an industry spent billions on technological development for deep-water oil drilling and again almost nothing on managing the potential for negative consequences of their exploitation of natural resources for private profit. I suppose this tendency to bury our heads in the sand is related to the same psychology that results in lack of personal savings in our society, the greed of those who don’t look back at the consequences of their self-enrichment, and perhaps a decline in the very fiber of civilization that holds humanity together. What to do about it? How to turn these high risk trends around? Take more personal responsibility for protecting our natural environment, protecting our built environment, supporting the social systems that are working or can be made to work to maintain social vitality. Reform government, beginning with term limits to encourage citizen politicians. Put a couple bucks in the bank for a rainy day, and keep some survival supplies in your home and car, and help your community prepare for the unthinkable, too. Thinking about the unthinkable consequences of life on earth is the best way to preserve the quality of that life! Today, media reports indicated that the marketing VP of BMW USA died in a “car accident,” which some might think implies that he was zooming around in a BMW, perhaps exceeding reasonable speeds and good judgement. The fact is, he was killed in a tractor accident on his upstate NY farm, and while trying to pull out a stump, the tractor flipped. 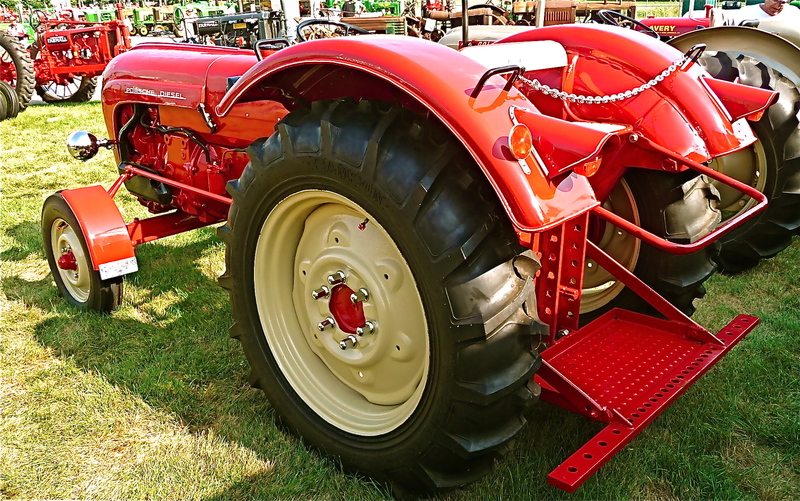 This farm accident on a tractor is totally unrelated to the man’s day job, and to simply say that he was killed in a “car accident” implies something else altogether. Hence the cynicism and callousness of trying to softly sensationalize, perhaps even unconsciously, a tragic accident unrelated to the man’s job and product shows through. .
A Porsche Farm Tractor — sure! 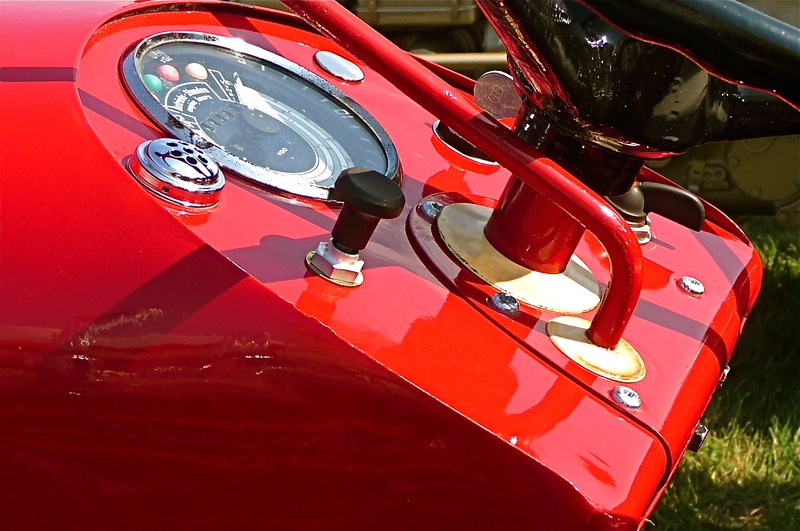 Took these pics at the first Mecum antique farm tractor auction 2 weeks ago here in Walworth, WI. 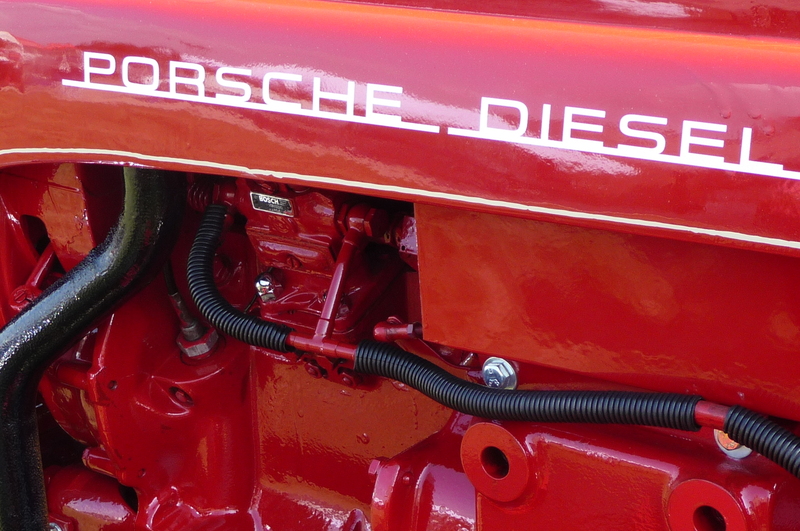 I had a guards red 1985 Porsche 944 cabriolet with bronze BBS wheels and tan leather sport seats that would have looked pretty cool alongside this Porsche diesel tractor. 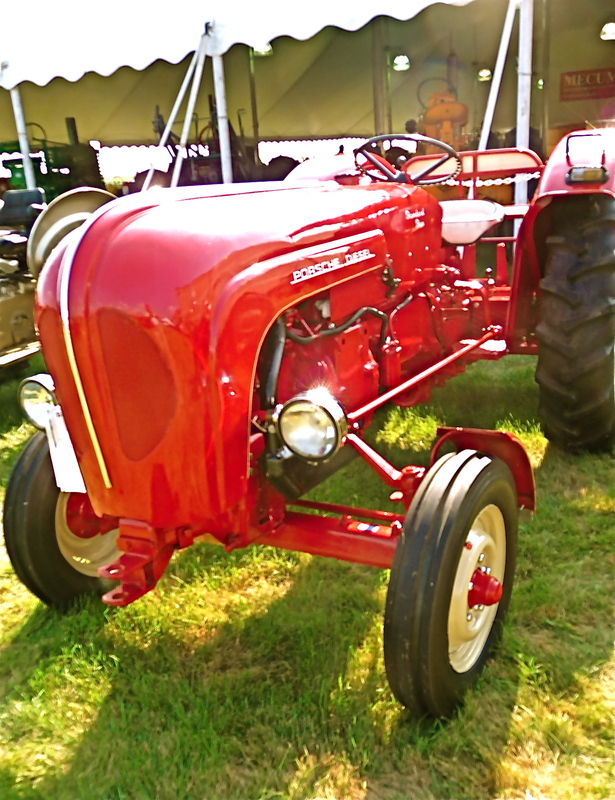 The tractor, in like new condition, sold for $11,200. Great buy for a vintage Porsche! It’s about politics, and baiting religious people. Once again in life, while religion itself is the underlying problem, those who would further exploit the religious for partisan political reasons are despicable. 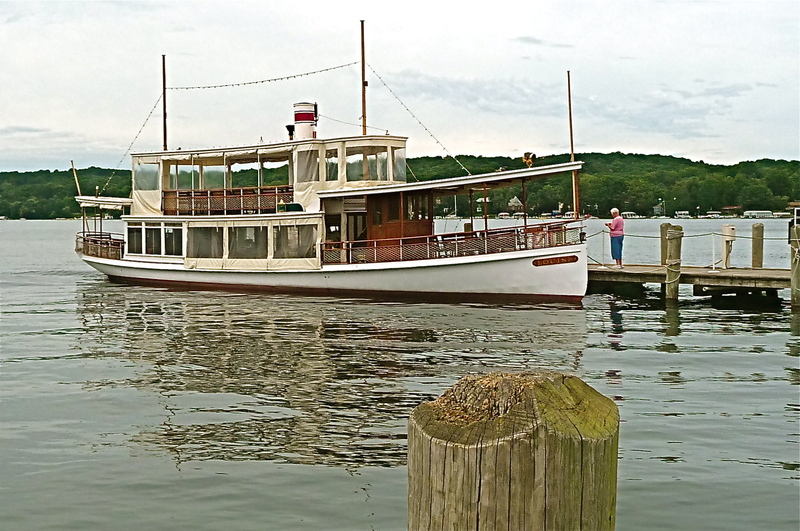 The restored Steam Yacht Louise, built 1902. 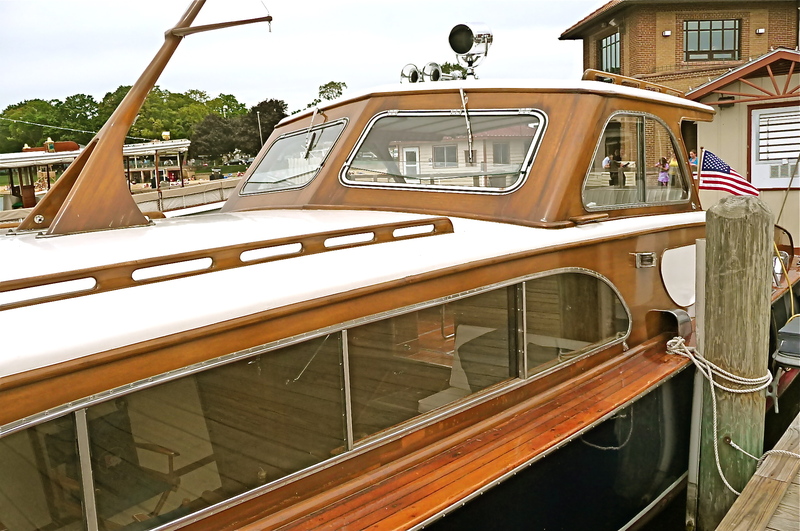 The graceful Lorelei, a 41 foot cruiser built 1954 in Holland. Somehow, leaving 50,000 troops in Iraq to work as “trainers and advisors” doesn’t smack of an end to the war in Iraq, and it doesn’t even stack up to the shameful 60-year garrisons we’ve left behind in Germany, Japan and South Korea. While the returning “combat” troops deserve our thanks and appreciation, I hope there are no victory ticker tape parades in NYC or DC, or any crowing from the imperial White House for a so-called “end” to the war that’s gone on longer than the Civil War or WWII. I started my adult life wasting 3 years in the Army during the dumb Vietnam War, and the beat goes on to this minute. It was on this day in 1907, despite a heavy rainstorm in Seattle, thousands of people showed up for the opening of Pike Place Market. It is the oldest continually operating farmers’ market in the country. As I was listening to CNN on the car radio yesterday, 2 guest commentators began to talk over and cut each other off as they ranted on some controversial topic. I love a good argument, but when people do that, as CNN and other talk shows seem to increasingly encourage, I just change the channel. When you can no longer follow or understand the exchange, and the guests descend into fury, feigned or real, I have no time for it. Spirited debate is fine, but such brawls are perhaps best left to the reality shows, those Roman Colosseums of disgusting combat of our day. If CNN and the rest don’t get the hint to bring back some civility, they won’t get my attention at all anymore.